Some background: I have a table with a laptop on it, and a chair sitting here that has a mesh back on it that has a pattern of ~2mm holes cut into black material in a regular pattern. I happened to notice one day that I could see the dotted pattern from a distance of about 7-8 ft, as I looked through the chair back. The thing is, I am quite nearsighted, my right eye being more nearsighted, with everything beginning to blur at about 15" without glasses. The effect: I am trying to understand what is causing my eye to still be able to see some sort of detail at that distance? I can still see a very clear pattern of multiple dots of light, as though my vision was okay at that distance. Anything else at that distance is just a big blur so how come the light passing through this mesh is still perceived by my nearsighted eye with a pattern? Is something happening to the light that is causing some kind of interference pattern that my eye can see? I have attached some photos of the view to try and explain what is going on, although through a camera I can't make it see what my eye is seeing. And a sketch. Very weird! I hope someone can explain this very curious effect. How is it everything else becomes a total blur at this distance but my eyes still see a clear dotted light pattern when looking through the mesh? Thanks for any ideas! What is near vision ?? it's something caused by the lens in your eye causing distant objects to be out of focus , but if there is a pattern perhaps the out of focus images reinforce one another and create a clearer image ??? More data needed ... Is 8 ft the only distance this happens at?? can you look at the mesh 4ft and 16 ft away and see what happens ?? Have you got a flour sieve, or other type of mesh to experiment with?? Another light source?? 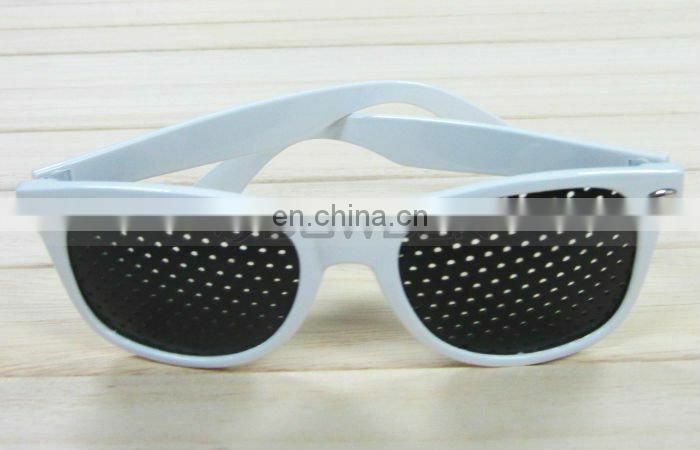 From Search ..."Pinhole glasses can certainly make your eyesight clearer… while you are wearing them. ... Some pinhole glasses manufacturers argue that the clearer vision their products give users can become a permanent improvement. They believe that pinhole glasses train your eyes and eye muscles to focus properly again"
looking at those glasses above , the light intensity reaching the eye must be reduced to about 15% of normal , this may have something to do with it. Last edited by oz93666; Feb 12th 2019 at 08:58 PM. rather than actually making the pattern clearer. However at all other locations (closed parts of the mesh, dark parts of the pattern) you will see a dark spot. This results in the pattern you actually see having wider spaced bright spots than the original pattern on the screen. I can see a mesh pattern (which is larger than the actual weave). Last edited by Woody; Feb 13th 2019 at 03:12 AM.